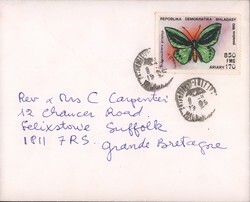 This envelope is addressed to Rev F C Carpenter and his wife at their address in Felixstowe, Great Britain. It was sent from Fiaraha-Miaina Amim-Bavaka Mamre FJKM (FAZA), Ambavahadimitafo, Antananarivo. 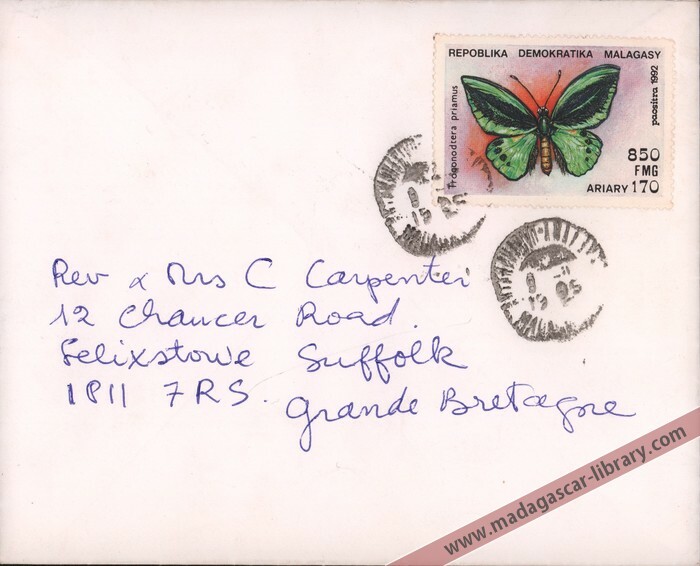 The postmark appears to read 9-11-1995. It bears one stamp with face value 850 francs (170 ariary) and depicting a common green birdwing butterfly (Michel catalogue code: MG 1372; Yvert et Tellier catalogue code: MG 1073).